Fujitsu Laboratories Ltd. today announced development of the world's smallest sensor that eliminates the need to replace batteries. The new sensor supports Low Power Wide Area (LPWA) wireless transmission technology that can reach a broad area with low power. As the spread of IoT systems gains momentum, expectations are rising for sensor devices that support LPWA technology, which can wirelessly transmit sensor information directly to the cloud. In order to create systems that employ this technology, there has been a demand for the development of easy-to-install miniature devices using solar cells to achieve both convenience and low cost, which dispense with the need to replace batteries . Fujitsu Laboratories previously developed power control technology(1) that can operate a beacon with the power provided just by a solar cell. Conventionally, power output variation of solar cells due to temperature had been tolerated by enlarging the size of energy storage elements. Now, however, Fujitsu Laboratories has developed technology that achieves high power efficiency by controlling signal transmission timing based on the temperature variation measured by a temperature sensor, which makes it possible to reduce the required energy storage elements for signal transmission by half. This has enabled Fujitsu Laboratories to successfully miniaturize the device to a size of 82x24x6 mm, creating the world's smallest sensor device supporting LPWA that does not need replacement batteries. In a test of the sensor device using this technology, Fujitsu Laboratories confirmed that the collected temperature and humidity data can be transmitted to a Sigfox(2) base station over a distance of about 7 km. Since it is now possible to acquire measured data even from locations where it is difficult to secure power and install power cables just by placing these sensor devices, the maintenance-free deployment and management of IoT systems has become a reality, accelerating the process of on-site digitalization. The spread of IoT systems has progressed in recent years, and it is predicted that by 2020, several tens of billions of IoT devices will be connected to the cloud through networks. In IoT systems, information collected from multiple sensors installed in the field, need to be transmitted to and analyzed on the cloud, and LPWA has been gaining attention as a wireless technology that can directly transmit data to the cloud with low power consumption across a wide area. From a convenience and cost standpoint there are high hopes for miniaturization, which not only meets the LPWA standards, while utilizing solar cells that eliminate the need for replacement. Fujitsu Laboratories has previously developed power control technology using miniature circuits that can transmit data over short distances wirelessly using Bluetooth Low Energy (BLE). This technology realizes sensor devices that support BLE without the need to exchange batteries, providing power with solar cells, and reliably activating a wireless circuit by monitoring and adjusting the balance between power generation and consumption. Sensor devices using this previous technology, however, could not support LPWA. That's because the time required for transmission with LPWA is significantly longer than with BLE. LPWA transmits small amounts of data slowly in order to ensure signal quality over long distances. In effect, this means that a single transmission can require significant power usage of up to about 1,500 times of BLE. Now, Fujitsu Laboratories has developed new power control technology to ensure transmission power while minimizing circuit size. This technology's advantages are as follows. 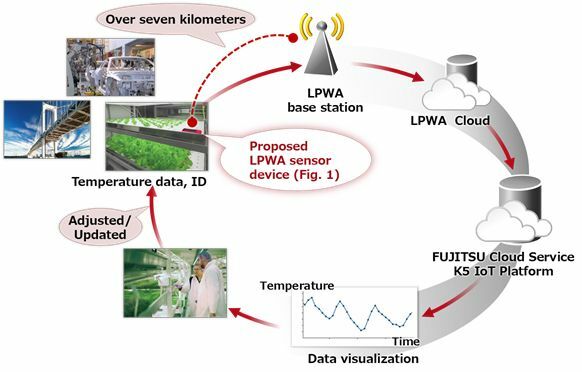 Fujitsu Laboratories has developed power control technology that can control the timing of LPWA signal transmissions in real time, based on temperature data collected from a temperature sensor. With this technology signal transmissions are only carried out at the time when the activation voltage, which varies with temperature, is maximized in order to prevent it from falling below the minimum operational voltage for LPWA module (Figure 3). By using power efficiently in this way, it is possible to tolerate variation in power consumed by the wireless circuit or power generated by solar cells due to temperature. This eliminates the need for the excess energy storage elements that were previously necessary to respond to power fluctuations, enabling miniaturization of the sensor device with the smallest power storage elements required. In order for the power control technology to operate reliably, the device must be able to continually and reliably activate the temperature sensor with a small amount of power. 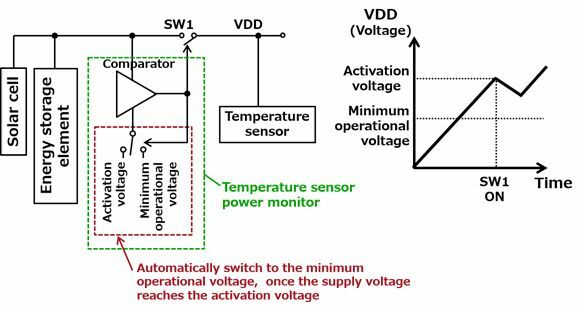 To resolve this challenge, Fujitsu Laboratories has developed power monitoring technology that analyzes voltage changes in power source, and accurately judges whether or not sufficient power has been stored to operate the temperature sensor. This technology can prevent unnecessary shutdowns of the temperature sensor by using the minimum amount of power based on the temperature. This technology was implemented using Sigfox, an LPWA standard, creating the world’s smallest sensor device (82x24x6 mm) supporting LPWA communications without the need to replace batteries. Fujitsu Laboratories verified that temperature and humidity data could be transmitted once every ten minutes, over seven days directly to a base station about 7 km away, in an environment with illumination of 4,000 lux. Fujitsu Laboratories also verified that the data could be visualized through the Fujitsu Cloud Service K5 IoT Platform, Fujitsu Limited’s IoT data utilization platform service, which has received Sigfox Ready Program for IoT PaaS certification as an IoT platform that connects to the Sigfox cloud (Figure 5). This means that sensor data can easily be acquired in the cloud just by setting sensor devices, even in places where it is difficult to secure power or install power cables. This will enable maintenance-free installation and management of IoT systems, accelerating the process of digitalization in the field. Fujitsu Laboratories will continue to conduct field trials aimed at the real-world use of these sensor devices, incorporating this technology into the Fujitsu Cloud Service K5 IoT Platform and Fujitsu Frontech Limited's sensor solutions as connected devices, with the goal of commercialization in fiscal 2018. Furthermore, we will continue to develop technologies to miniaturize sensor devices. As the utilization of IoT is expected to continually increase, KCCS predicts that solutions utilizing the low power consumption feature of the Sigfox network will be developed in a variety of industries. KCCS believes that Fujitsu Laboratories Ltd.’s development of a sensor device, which does not require battery charging by way that device operation is enabled by a solar battery, will promote the use of Sigfox not only in Japan but around the world. As the Sigfox Operator in Japan, KCCS is working with Fujitsu Laboratories Ltd. and other partners to enable everything to be connected to the Sigfox network and is contributing to the creation of a safe and pleasant society.